An infusion of water, black tea, ascorbic acid. 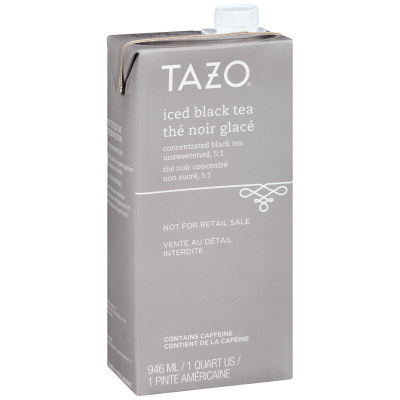 Treat your guests to a boundary-breaking taste adventure with Tazo Black Iced Tea Concentrate. Made with fresh, handpicked ingredients, this premium iced tea concentrate creates delicious iced tea with no brewing required, and it invigorates the senses with rich, vibrant flavor and aroma. The tea concentrate also allows you to easily expand your beverage offerings to include creative drinks like iced tea lattes, lemonade-and-tea coolers, tea cocktails, spritzers, and more. Whether you're an office manager looking to ignite the creativity of your workforce, or a café owner in search of a deliciously unique flavor offering, you will love serving this beverage that inspires joy and wonder with every sip. Shake the carton and mix one part of concentrate with five parts cold water. Serve individual beverages over ice. After Opening: Store the unused portion of this product in a refrigerator and use within seven days. Before Opening: Check the "best before" date on top of the carton.